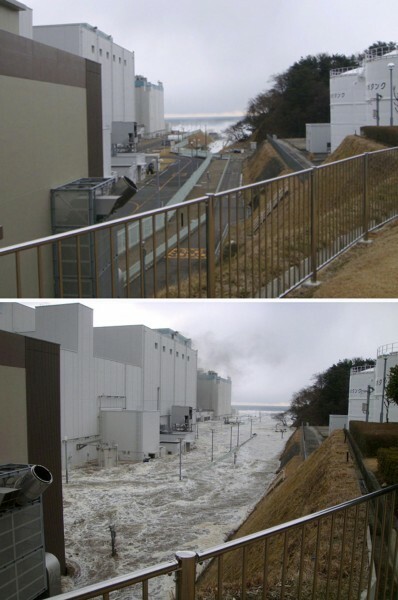 Two photographs show the Fukushima Daiichi tsunami defenses being overwhelmed by the tsunami on March 11th, 2011. Tokyo Electric, the operator of the crippled Fukushima Daiichi nuclear power plant, has released a document during a lawsuit brought by over 40 shareholders which reveals the utilities acknowledgment that tsunami defenses at the plant were not adequate. The internal document from 2008 noted that TEPCO executives had agreed that it would be “indispensable” to further build up coastal defenses for the plant in order to protect against a tsunami larger than had previously been recorded. The utility has asserted that it could not have foreseen a tsunami of the size or magnitude that hit the plant in March 2011, that it had done everything it could to protect the nuclear power plant, took every available precaution against a tsunami, and has used that defense to protect itself from litigation. This positioning by TEPCO has allowed the utility to argue that it is not responsible for the triple meltdown, but the internal document casts a definitive shadow over that claim. Insiders from the nuclear industry in Japan have come forward since 2011 and claimed that TEPCO and the federal regulators ignored warnings of larger-than-expected tsunami in northern Japan for years. By ignoring these warnings, TEPCO delayed implementing countermeasures, including but not limited to increasing the height of protective wave barriers or removing the critical emergency backup diesel generators from the basements of the reactor buildings to higher ground. At a nuclear engineering conference in Miami in July 2007, Tokyo Electric researchers led by Toshiaki Sakai presented a paper which concluded that there was a 10% chance that a tsunami could test or overwhelm the defense at the Fukushima Daiichi nuclear power plant in the next 50 years. Engineers from TEPCO confirmed Shimazaki’s concerns in 2008, when they produced three unique sets of calculations that revealed tsunami waves up to 50 feet tall could hit the Fukushima Daiichi nuclear power plant. The utility sat on the information for nearly a year before handing it over to federal regulators and didn’t reveal the 50-foot wave calculation until March 7th, 2011, but by then it was too late. In hindsight, it can now be seen that TEPCO scientists realized by at latest 2004 that it was indeed quite probable that a giant tsunami could overcome the defenses at the Fukushima Daiichi nuclear power plant — defenses which were based on engineering assumptions that dated back to the plant’s design in the 1960s.